Hair! If you want to be a rock and roll legend. You need it. Not just any kind. Jet black, like the color of licorice candy, strong, yet sweetly enticing, with a chic sheen that can imbue a man with the kind of confidence that will shake the world. Curls. The kind of curls that bounce like a fox, frolicking through an open field to weave an aura of musical magnificence around your very soul. We're talking serious, mother-loving, hair. You dig? This Purple Rock Legend wig is the answer to your prayers. It's got style. It's got attitude. It's got the kind of curls and sheen that will make a dove break out into tears. It's exactly that epic. So, put it on, grab your Telecaster and put your purple suit on. It's time to give the world the performance they'll never forget, with hair that will leave them craving an encore. Will you give it to them? That's entirely up to you. 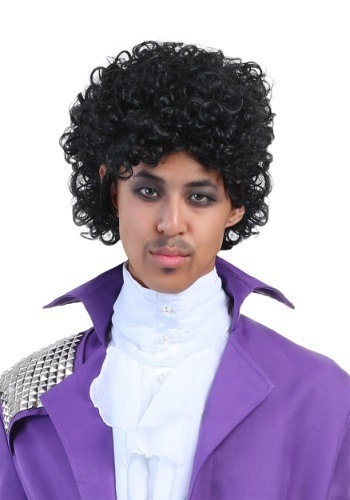 I am dressing up as Prince this Halloween and the wig is great although I may slightly trim the sides since it seems a little poofy but we will see. I love this costume and this is a great price for the wig.